Remarkably, Bhagavad-gita, the main source book on yoga and the best-known classic of vedic literature, comes from a half-hour heart-to-heart talk in the middle of a battlefield. At the last moment before entering the battle, the warrior Arjuna breaks down. Why should he perform such a detestable duty? Why not give it up? Why does he exist? Where is he going after death? In Bhagavad-gita, Lord Krishna, the Friend and Spiritual Master of Arjuna, brings His disciple from perplexity to spiritual enlightenment. O expert and thoughtful men, relish Srimad-Bhagavatam, the mature fruit of the desire tree of the vedic literature. It emanated from the lips of Sukadeva Goswami, Therefore this fruit has become even more tasteful, although its nectarean juice was already relishable for all, including liberated souls. This Bhagavat Purana is as brilliant as the sun, and it has arisen just after the departure of Lord Krishna to His own abode, accompanied by religion, knowledge, etc. Persons who have lost their vision due to the dense darkness of ignorance in the age of Kali shall get light from this Purana. Four hundred years ago, Columbus was circumnavigating the globe to find new oceans and continents— probing the material universe. While Columbus and others were discovering the mysteries of the world outerly, Sri Krishna Caitanya was disclosing the mysteries of the world within, of the man’s hightest spiritual perfection. Sri Caitanya Caritamrita is the complete authorized biography of Sri Caitanya Mahaprahu. The sixteenth-century figure revolutionized India in several ways: intellectually, by drawing learned attention from the impersonal to the personal feature of the Absolute; spiritually, by founding a prodigious theistic movement; socially, by debunking and reforming the caste system; and politically, by launching a mammoth civil-disobedience movement in Bengal, 450 years before Gandhi. 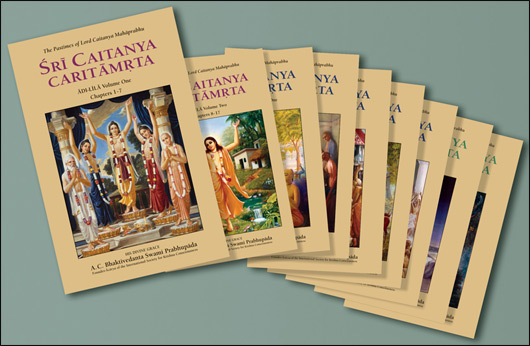 Although the original Bengali text came from the pen of Krishna dasa Kaviraja Goaswami in 1626, the complete Sri Caitanya-caritamrita is now reaching Western readers, through the translation of His Divine Grace A. C. Bhaktivedanta Swami Prabhupada. (9-vol. set, 7674 pages, 144 full color illustrations).